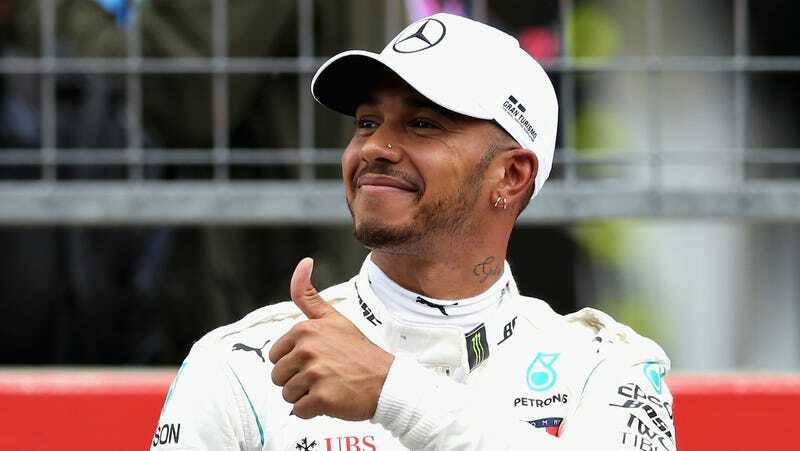 Formula One driver Lewis Hamilton just signed another two years of his career to Mercedes, which hasn’t been as dominant as usual lately but evidently isn’t hurting financially because of it. Reports say Hamilton will make up to $51.9 million per year through 2020, or way more than LeBron James’ contract. In terms us regular folks can understand, Hamilton, who’s 33 and has four F1 championship titles so far, will make more than what James’ new contract with the Los Angeles Lakers is worth. James signed with the Lakers for $154 million over four years, which breaks down to $38.5 million each year. Hamilton’s minimum is slightly more than that, but his max salary with Mercedes is more than $13 million higher. That’s a lot of millions right there, the least of which any of us would probably be thrilled to make. And while a pricier contract than James certifies the fact for us common folk that Hamilton’s making a lot of money over the next two years, it should be noted that James is widely considered underpaid due to contract rules and salary caps in the NBA. The figures above are just contract numbers, too, and Forbes’ 2015 list of highest paid athletes had James at an additional $52 million in endorsements. Hamilton was listed as earning $9 million there. So, yeah, they’re both pretty rich and will be competing in their respective sports for at least a few more years. Most of us aren’t and will be working until we’re 70, when we realize we haven’t done any of the things we wanted to do in this life.